On DVD from SHOUT! 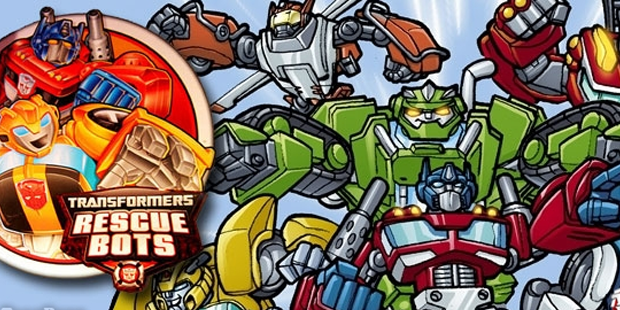 Kids Factory and Hasbro Studios comes the next installment from the beloved animated TRANSFORMERS RESCUE BOTS: Mystery Rescue. This film brings us back to Griffin Rock! Chase, Heatwave, Blades and Boulder are once again helping the Burns family. There are mysteries to be solved in Griffin Rock and the Transformers don’t waste a moment to find answers. This time their adventures have them chasing ghosts, a few gremlins but more importantly searching for the legendary Maine Ridge Monster! FINAL WORD: I have to say that I absolutely love when these DVD’s arrive at my door. It’s a great chance to watch some wonderfully done animation with characters that I have come to appreciate the more I see of them. These are the types of shows that are amazing for families to watching together because, although they are entertainment, they also have such poignant storylines. The Burns family works together to solve mysteries or problems that happen in their hometown of Griffin Rock. That is a huge lesson about helping one another. There is also the storyline of the Transformers themselves! They are away from home and other Transformers yet do not hesitate to do what is right by the people of Earth. Now those are the kinds of friends I’m sure we all wish we had. TUBS OF POPCORN: I give TRANSFORMERS RESCUE BOTS: Mystery Rescue four tubs of popcorn out of five. I really do have a good time watching this series. Hasbro and Shout! Kids Factory once again have come together to bring quality entertainment for both kids and their parents. Oh come on, admit it, grownups are having a blast watching this show as well! The animated DVD include the episodes “Countdown”, “The Haunting of Griffin Rock”, “Spellbound”, “Blame the Gremlins: and “Feed the Beast”. There is plenty to enjoy with the running time of 110 minutes! In the end – the game is afoot!